Big. Bold. Visionary: Chicago Considers the Next Century, another event commemorating the Burnham Plan Centennial, taps local architects, planners, and landscape architects to envision the ideal Windy City of the future. Some designers took a creative and sometimes whimsical approach, while others offered up more practical concepts. Filter out the public relations boosterism and the show offers plenty of inspiring ideas to further Burnham’s goal of creating a beautiful lakefront accessible at all points north and south. On the far south side of the city, Phillip Enquist of SOM envisions a high-density mixed-use development at the 573-acre site of a former steel manufacturer. The surrounding neighborhoods, many of which are economically depressed, could benefit from Linda Searl’s temporary three-year functional structures, designed as infill for empty lots. 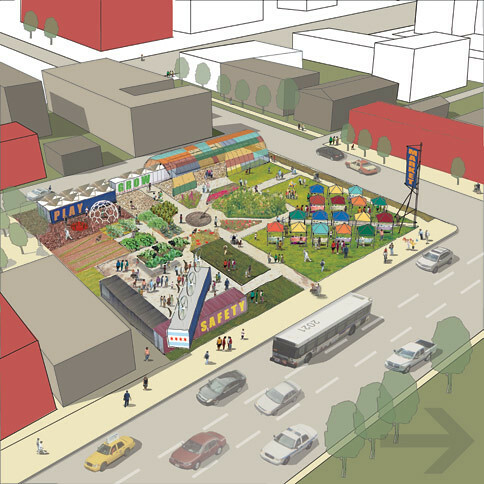 The infill structures would act as a catalyst for commerce, development, and to improve the overall quality of life of the neighborhood. Other proposals took the title of the show to heart: big and bold. 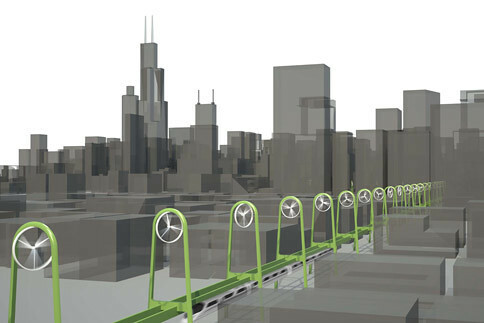 Adrian Smith’s two mile-long eco bridge would arch out into the lake from Monroe Harbor, the center of which would stand a tall tower to harvest wind and solar energy. 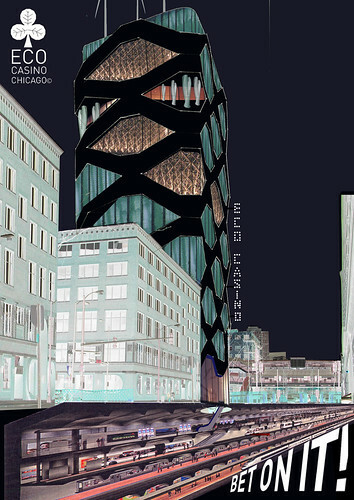 Others inspired strong reactions, like the Jeanne Gang’s shudder-inducing eco-casino or Ralph Johnson of Perkins + Will’s international airport developed in Lake Michigan at the terminus of Congress Parkway. The show, while not as flashy as the Centennial’s other events, is no less important. Building on the legacy of Burnham, it will help facilitate conversations about future planning and showcase the city’s current design talent. Big. Bold. Visionary: Chicago Considers the Next Century is at the Chicago Tourism Center Gallery, 72 E. Randolph St. through October 4.